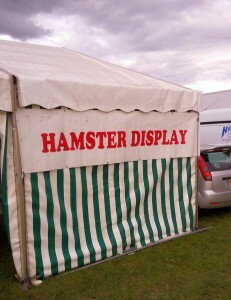 Living Heritage kindly provide us with a Marque in which we hold our display. 2016 sees our 25th year with them, starting at Blenheim Palace in August 1991. 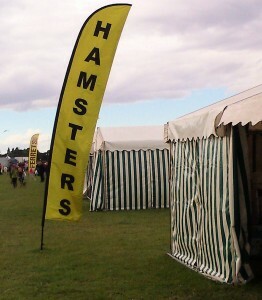 Also in the Marquee are display boards with photos of many of the more unusual colours and types of hamster, photos of babies hamsters from 1 to 37 days old, photos taken by our members of hamsters (both babies and adults) in all sorts of situations and poses. When we do displays there are many people involved and it would only be right for me to mention them. (In no particular order). Jean Tye (Tristar), Sue carter and Mark Harris (Bourne Valley), Julie Young (Dragonfly). Dawn Mason (Camelot), Gill and Adrian Rigden (Paradise Hams), Kim and Craig Lewis (Olympus Hams), Debbie Clarke and Chris Bodley, Shirley Evans, Chris and Pete Logsdail (Towy Vale). The above come from all over England and Wales to be at the displays all at their own expense. This is the first post on a Blog by Pete of Towy Vale Hamstery. Hopefully I will keep everyone informed of what is happening during the coming year. 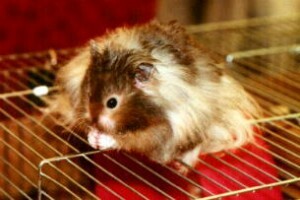 With a gang of other dedicated hamster keepers we will be putting on displays covering most of the Country.